I managed to find time to squeeze in a couple of photos this morning, thanks to lovely Jon and his camera skillz (I have to big him up otherwise he might stop taking them for me and I will finally have to fork out for that tripod). This is a good example of what I consider "smart" work dressing - arms and legs on show with everything else covered! I also threw a little white cardigan over the top of this as our office has a tendency to get a bit chilly despite the conspicuous lack of air-con. 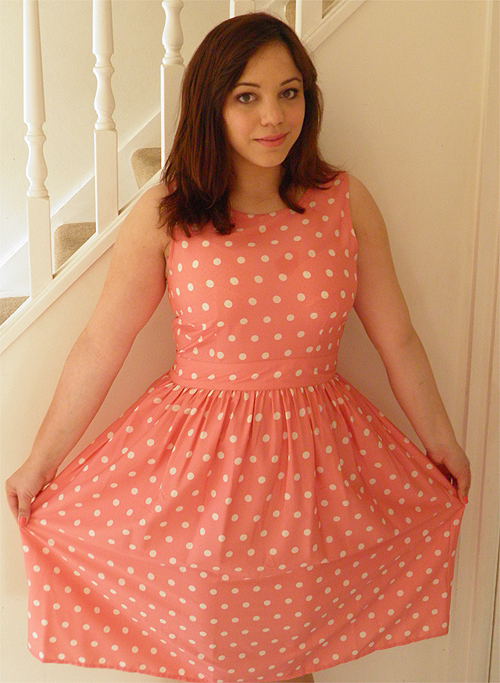 I've had my eye on this dress ever since it first appeared in Look magazine before spring had actually sprung, but after seeing it in-store I was reluctant to pay full price as it is quite a flimsy fabric. 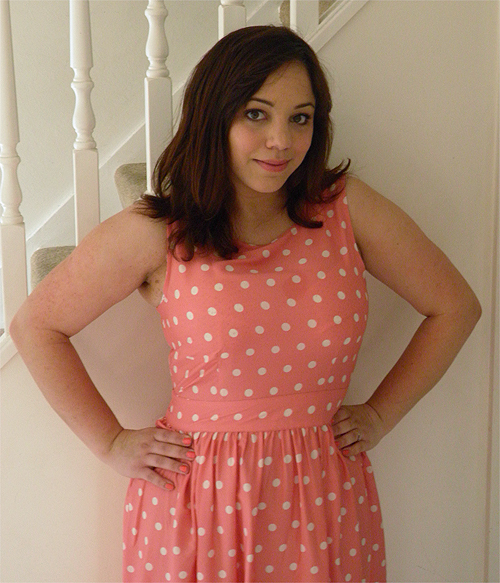 I'm also not 100% swayed by the cut as it gapes at the arms and perhaps I should have gone for a size down, but such is the nature of sale shopping, you're forced to take whatever size is on offer and in my view polka dots are always a winning print! Still the colour is gorgeous and summer and I got so many compliments today, Dorothy Perkins just cannot do any wrong in my eyes! They also had the lilac version of this dress in their online sale for about £17, but when I checked today to give you a link I can't find it anymore. Perhaps they'll still have them instore if anyone is interested? Apparently the lovely weather we've had today is leaving tomorrow, so I probably will be going back to jeans for warmth! I am still compiling my "smart workwear" post though as it's something I personally like to read about and hopefully this way we can all share ideas and inspiration. On that note may I direct you to Maria's blog as I love how she does smart clothing and quite often look to her for inspiration! I really loved these dresses, but they're just too long on me. You look so pretty though! I've wanted this for ages but completely missed out in the sale. Boo! I recently stumbled across your blog and I LOVE it! I love the layout to the content and everything in between! 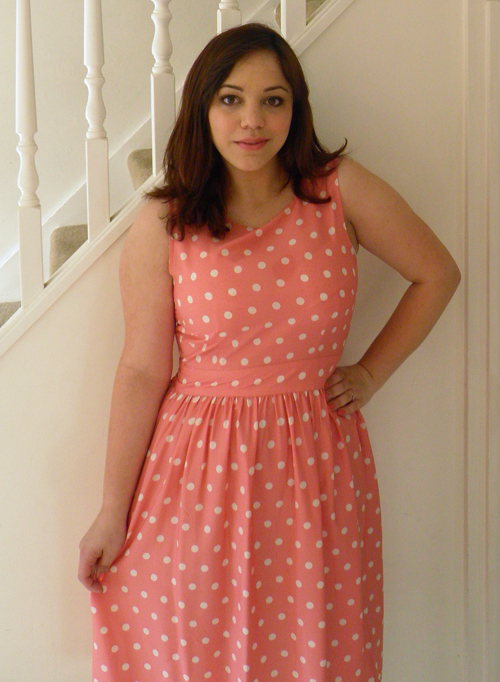 I absolutely adore the pink polka dot dress you are wearing! Your style is just impeccable and your blog is simply the epitome of perfection! I am your newest, most avid follower, I look forward to reading your future posts. I would love it if you could perhaps follow me back too? Have a lovely day!